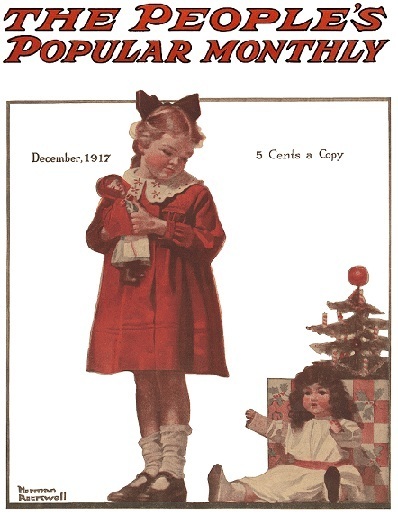 Girl With Christmas Doll, this Norman Rockwell painting, appeared on the cover of Peoples Popular Monthly published December 1917. This was the third cover by Rockwell to appear on Peoples Popular Monthly. Peoples Popular Monthly only published three Rockwell covers, all in 1917. Rockwell only submitted to this smaller magazine after the publishers of the larger magazines had declined to publish the cover illustration. You can see the other two Peoples Popular Monthly covers here: Two Boys Making Ice Cream and No Credit Given. This is another of those rare Norman Rockwell's. I found this one on eBay. I have only seen it for sale three times in over five years and two of those times were recently. One copy sold for over $100.00 and the other sold for $75.00. Quite an increase for an old piece of paper that was once attached to a magazine that sold for five cents brand new! In this painting, Norman Rockwell gives us a glimpse into the sheer magic of beloved Christmas gifts, both past and present. This little girl has just discovered her Christmas gift. The time is either Christmas Eve or Christmas Day, depending on when you, the viewer, exchange or bestow presents. She has just found her new doll, a gift from Mother and Father. The little girl has a dilemma. She loves her old dolly. Her old dolly was probably a Christmas gift from last year. Most children did not receive toys year round in 1917. And yet, the new doll is all pretty and new and wearing a new white dress with a red ribbon as a sash. She is torn between her loyalty and love of her old doll and her attraction to the new doll. Hopefully, it won't take her long to realize that her old doll would love the company of the new doll. They can be one bigger happy family. Rockwell also shows us an historical relic in this painting. The Christmas tree is very small, not oversized like is popular today. Also, if you look carefully, you can see that the lights on the tree are little candles. Of course this was somewhat of a fire hazard, even though someone was always watching the tree when it was lit. Otherwise, what would have been the point of lighting all those candles?